We’ve hit another marker on the countdown to polling day, so it’s time for my monthly prediction of the result. As before, I’ve tinkered with my forecast. This time it’s largely at the expense of the Lib Dems and to the benefit of Labour and the Conservatives. I’ve also scaled down my expectation of how many Tory seats will switch to Labour. Once again I’m forecasting a hung parliament. But this is the closest result I’ve come up with since I started this blog. I’m now suggesting Labour will win 293 seats (up 35 on the 2010 result), the Tories will win 289 (down 15), the Lib Dems will get 39 (down 18) and the others – including the Speaker – will be unchanged on 29. I’ve increased the number of gains both Labour and the Tories could make from the Liberal Democrats. I’ve done this partly because of June’s opinion poll trends, which showed the Lib Dems slumping to their lowest share of this parliament. I’ve also taken into account the findings of Lord Ashcroft’s surveys of Lib Dem-Tory and Lib Dem-Labour battlegrounds. In addition I’ve revised downwards the number of seats I suspect Labour will win from the Tories. Despite the party’s small, sustained lead in the polls, the legacy of May’s local elections has been encouraging me to think the party will not do as well in the southern counties of England as it will in northern England, metropolitan areas in the Midlands and in London. As such I’ve decided – perhaps rashly – that Labour will not win either Warwickshire North or Thurrock, despite their Tory majorities being just 54 and 92 respectively. What I’m left with is a result that is almost a tie. The four seat-gap separating Labour from the Tories is the same as that which separated Harold Wilson’s Labour from Edward Heath’s Tories in the February 1974 election. A Tory-Lib Dem coalition would add up to 328: two more than the figure of 326 needed for an overall majority. 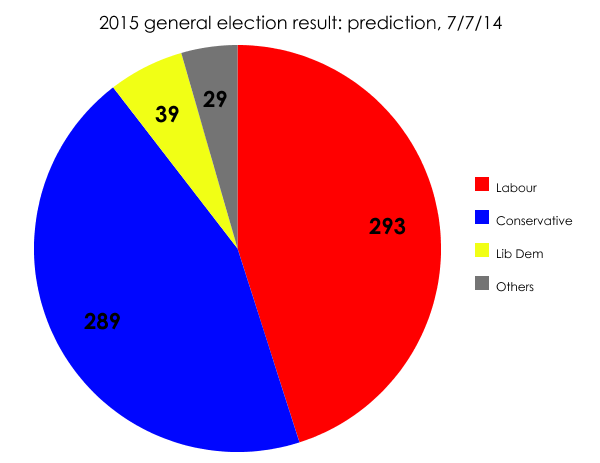 A Labour-Lib Dem coalition would add up to 332. From the Lib Dems: Norwich South, Bradford East, Brent Central, Burnley, Manchester Withington, Dunbartonshire East, Birmingham Yardley, Hornsey & Wood Green, Cardiff Central and Cambridge (total = 10). From the Tories: Hendon, Cardiff North, Stockton South, Lancaster & Fleetwood, Broxtowe, Amber Valley, Wolverhampton South West, Carlisle, Morecambe & Lunesdale, Weaver Vale, Lincoln, Plymouth South & Devonport, Stroud, Brighton Kemptown, Bedford, Warrington South, Enfield North, Northampton North, Brentford & Isleworth, Croydon Central, Harrow East, Ealing Central & Acton, Norwich North, Ilford North and Finchley & Golders Green (total = 25). I’m a naturally cautious person, so I’m happy to accept this forecast may underestimate the performance of both Labour and the Conservatives, and might also be too generous to the Liberal Democrats. But at the moment I’m inclined to think we’re heading for one of the closest election results in four decades. This result would produce different position than that in February 1974, though. Heath could or would not agree to the Liberals’ demands to form a coalition, nor reach a confidence and supply arrangement with the Ulster Unionists, so resigned. Wilson’s minority Labour government could not survive so we had a second election in October 1974 when Labour achieved a thin majority which lasted until 1979, and the rest is history. Unlike February 1974, this result would give the third party enough seats to support a thin majority for either main party (majority of 6 for Con-Dem, or 14 for Lib-Lab). In practice, the working majority should be a bit higher as (for example) Sinn Fein won’t turn up, and the Speaker and deputies don’t usually vote. At the moment, it is hard to see any party achieving an overall majority. Will the Lib Dems stick with the current rather uncomfortable relationship with the blues, or will they defect to the reds? I agree we’re heading for another hung parliament. I wonder, though, if the Tories (or Labour) will try for a minority government this time. In 2010 Cameron used the “economy in crisis” line to get his party to sign up for a full coalition with the Lib Dems. That won’t work in 2015 – and I’m not sure most of his party would want a second coalition anyway. Labour may feel it worth going it alone too, daring the Lib Dems to side with the Tories and force a vote of confidence so soon after polling day. A minority government, followed by a second election later in the year (as per 1974) might be the way things turn out. Well, unlike February 1974, a general election in May 2015 does not leave much space for another election later that year! But, yes, I agree, we might have a second election within 12 months. I’m not sure who that might favour though – what do you do with a second hung parliament? So, presumably Cameron would be in the box seat after May 2015, as the incumbent Prime Minister. He would have to resign for Labour to get a chance. Who would benefit from a second election so soon after the first? The public might get fed up. Also some modeling of the outcome, with and without.